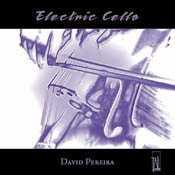 This is a collection of works in which the cello tangles with itself via electronic recording techniques. The listener need not know or understand these methods of composition- or even be entirely familiar with normal cello playing within its traditional literature. In fact David Pereira's fine playing is often surrounded by so many things not readily identifiable as cello sounds that it is the freshness of these marriages which may take much of every listener's attention in this music. The term 'electric' is just a title. Electric violins and cellos these days can be purple, bodyless instruments finished in that thrilling coloured metallic stuff for which the poor old Italian masters could not find the formula. And they are wired to shattering dynamic possibilities which may cover legion driver inadequacies. None of that here; just your good old varnished wooden box and bow recorded while playing into or beside electronic things. And some very good music! A thirteen-minute journey through attractive tonal country, this piece is imaginative, extremely beautiful and would be easy to live with for a long time. Begins with nervous portent. Gradually develops seriously intense stress levels. Uses the full gamut of nothing but available cello techniques recorded live and played back at intervals of 2 1/2 and 5 seconds while the performance proceeds. Another good piece. Fascinating, lovable, frightening. Such a masterfully complex collage can hardly be described. The subject is an old hotel in Dili, East Timor-still standing, post-maelstrom, as is a waiter whose name happens to be Joao Pereira. "When the old piano in the foyer suddenly springs into life, he takes out his metaphysical cello and starts to play . Riveting. A really tense atmosphere prevails throughout music that came from Ford's feelings about Uluru as it stands like a cenotaph in the centre of this country. The traditional string devices of harmonics, tremolando and powerful lower strings in double-stopped sostenuto are all driven to an imposing effect by the enormous spatial enhancement of the technology. This is originally a work for bass clarinet, adapted most successfully by Pereira. A 4 1/2 second delay is at work on all the phrases chosen by the player, the result being a fascinating moto perpetuo which would require several cellists if it were all written out. There is also a journey going on in the development of the engaging rhythms of this music, and such an exciting momentum is created that 9 + minutes from horizon to horizon simply fly away. I have never reviewed such a wonderful piece of work as this – a great and entirely Australian project, for which respect and congratulations must go to the composers, David Pereira and Belinda Webster's Tall Poppies. It is a CD which should be in every collection – obligatory for cellists. This CD is a rich treasure-trove of new and not-so new work for cello and electronics. Only one of the pieces here uses sounds other than David Pereira’s cello as a source for the electronics, but the character and diversity of the pieces always kept me involved, and sometimes left me jaw-droppingly impressed. Carl Vine’s Inner World is a very good opening track. The electronic sounds which accompany the solo part are, according to the composer, entirely derived from Pereira’s cello. This is sometimes clearly apparent; at other times the sounds have been treated so far beyond the cello sound as to be unrecognisable as such. This is not a criticism – in fact, the only disadvantage of this is that the session from which the samples have been taken seem to lack some of the refinement of the performed recording. Pereira’s cello answers itself like a violin, a plucked harp, like explosive drums, like birds, laughing Hyenas or burning trees. This is a remarkable soundtrack, with some beautifully expressive cello lines threading themselves between the effects, leading up to a rhythmic and ecstatic finale. Roger Smalley’s Echo II turns the solo part in three cellos playing in canon, with delays at 2.5 and 5 seconds. The first echo is placed soundstage left, the other to the right, and the solo part in the centre. This placing clarifies the counterpoint, and the clarity of David Pereira’s playing further heightens the effectiveness of this piece. The fact however remains that its concept is based on the use of antiquated electronics; and the essential predictability of this treatment on the cello line makes it a little grey and old-fashioned sounding by comparison with some of the more recent pieces. Martin Wesley-Smith is only a year or two younger than Smalley, but, 22 years after the previous work Welcome to the Hotel Turismo is a case in point. This is the one piece on this CD with an electronic backing track which has been manufactured from sounds other than the cello, and right from the start we get ‘Timor’, the location of this now derelict hotel, sung over the sound of vandals’ stones crashing through glass. The title is then wryly and dryly sung and pronounced over a Conlon Nancarrow-like bar piano and cello Tango, ‘although we’re always full, we will make you comfortable…’ and you just know you’re in for a good time. Wesley-Smith’s notes on this piece set the scene admirably, and our imaginations are set alight by the music as if we were reading an old colonial story by Grahame Greene. There’s a little of David Jaffe’s ‘Silicon Valley Breakdown’ world in this for me, in the sense of humour, but also in the swift and unexpected, but ultimately always logical and structured twists and turns. The cello joins Nancarrow’s bar piano in some wonderful nostalgic wallowing (I spotted at least one quote – is that ‘Feelings’? ), and time and place breathe over us like a sepia picture in sound – all ticking clocks, newsreel chanting and strange, echoing voices, gunshots, a crowing cockerel. This piece goes to show how it is possible to create an effective concrète tape accompaniment to a live instrument. There are enough musical clues and cues to integrate the cello part, and plenty of emotional movement – from surrealist cartoon soundtrack humour, through sheer good music, political statement and tragic irony – I love it. Andrew Ford’s Memorial refers to the handing back of ‘Uluru’ (Ayers Rock) to its traditional guardians (the booklet says ‘owners’, but that’s another debate). Ford wrestled with his reluctance to engage with Aboriginal culture, but ultimately, seeing Uluru’s physical presence as a kind of memorial, almost a cenotaph in the middle of Australia, expressed this partly as a lament, partly as a celebration of the strength and endurance of the Aboriginal people. The cello is treated with a delay which in fact makes it sound as if it is placed in a vast acoustic. The echoes come to us as if from the inside of caverns measureless to man, and to me very movingly express the loneliness and incredible hugeness of the Australian outback. Onomatopoeia by Nigel Westlake was originally written for bass clarinet and delay, and was adapted for cello with the assistance of David Pereira. This is not ‘just another delay piece’ as I was fearing. It uses the digital delay not only for repeating the cello line, but for holding musical moments in repeated ostinati – a little like Terry Riley’s early work, and with some similar sunshine harmonies to complete the comparison. The improvisatory nature of the music works well over the rhythmic soundbed of these delay patterns, and provide a fitting conclusion to this marvellous disc. The freshness and energy of this production leap at you from your loudspeakers. While not all the composers are Australian, to me the whole thing exudes Australianness, providing a sizeable window into the musical potential there. I had my own little musical performing tour of that land a year or so ago, and the impressions I gained then have been reinforced by this disc. If you will excuse me quoting from one of my own stories: "The greens are greener, the skies seem blue beyond blueness, and at night the moon and stars appear watchful and friendly, as if they sense a hope for the future which the northern hemisphere has already wasted." You want a little bit of that in your own home, surely? outstandingly versatile performer, unafraid to stretch technical and musical boundaries. With high praise given to his ten award-winning recordings such as Cello Dreaming (TP075), Uluru (TP0960), and Garden of Earthly delights (TP113), Pereira ventures even further afield in these works for solo cello. The five Australian composers - Carl Vine, Roger Smalley, Martin Wesley-Smith, Andrew Ford, and Nigel Westlake - featured here all have a close involvement with the soloist, from the inception of the work through its metamorphosis to the performance. This recording is not only a showcase for Pereira's considerable talents and ability to explore the emotional depths in these works. It also highlights sound engineer Christo Curtis's skills as a techno-wizard. The recording is clear, finely detailed yet warm, with a natural and unforced cello sound. In the early days of electronic music, many composers placed two tape recorders side by side, one recording a sound and the other playing it back a few seconds later. But the novelty of continuous echo became irritating. Digital technology changed that and three of the pieces on this disc, Roger Smalley's Echo II, Andrew Ford's Memorial, and Nigel Westlake's Onomatopoeia explore the idea with new-found sophistication. Smalley's work has a rugged modernist integrity and interest, Ford's explores lonely sounds of howling darkness and Westlake's is more affably breezy. More digitally developed, Carl Vine's Inner World for cello and sampled cello moves between yearningly expressive opening intervals, improvisatory scurrying apologies and a slick disco section with sounds like breaking glass. Pereira's playing is commanding and the sound outstanding with details not always apparent in live performances. Martin Wesley-Smith's Welcome to the Hotel Turismo is more radiophonic in conception, constructing a sonic narrative to evoke a war-shattered hotel in Dili.